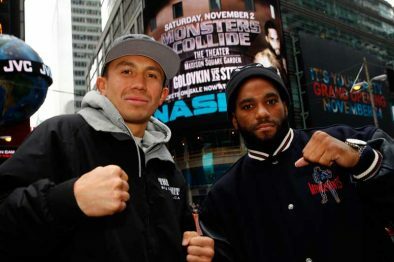 All photos, Will Hart/K2 Promotions – WBA/IBO Middleweight World Champion Gennady “GGG” Golovkin and top rated contender Curtis Stevens stopped traffic Wednesday in Times Square as highlights of their past fights were very featured on multiple video boards. NEW YORK CITY (October 30, 2013) WBA/IBO Middleweight World Champion Gennady “GGG” Golovkin held court today at Madison Square Garden for a huge crowd of fans and media in one of his final workouts ahead of his title defense against top rated contender Curtis Stevens this Saturday night, November 2 at “The Mecca of Boxing” and LIVE on HBO®. 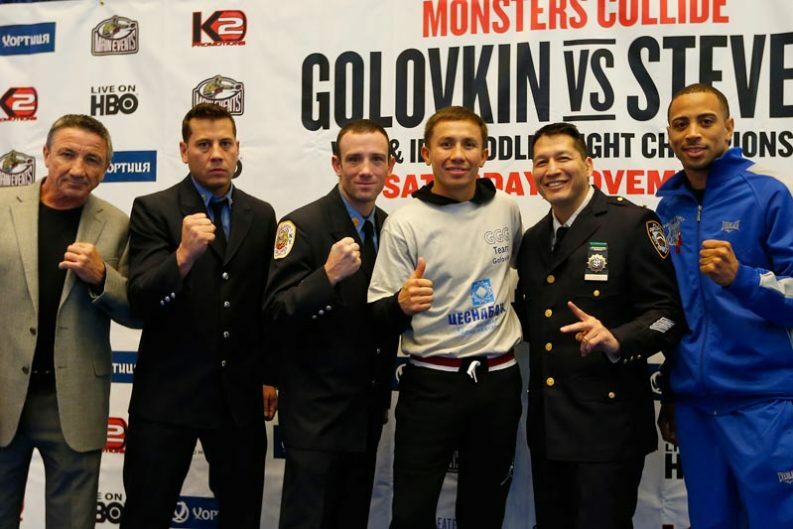 Among those present at the media workout were members of the New York Police Department and the Fire Department of New York, both of which will be guests of Golovkin’s on Saturday’s fight. 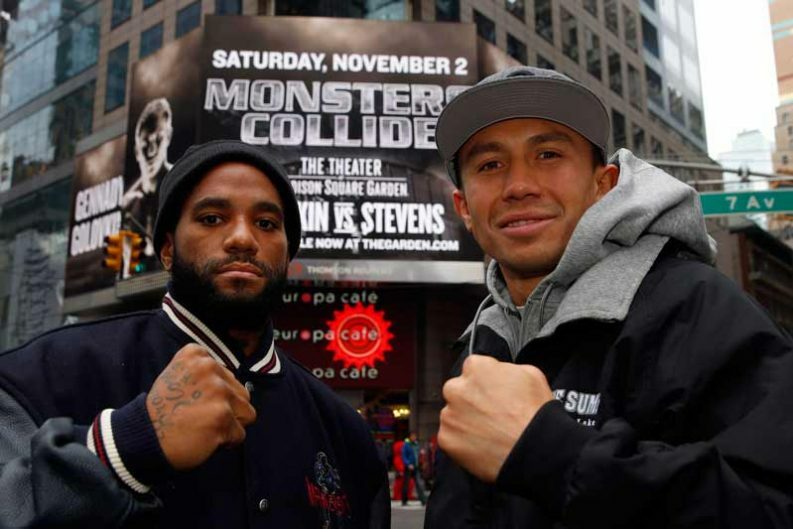 The officials have been assigned for this Saturday night’s WBA/IBO Middleweight World Championship between boxing’s fastest rising superstar, Gennady “GGG” Golovkin and top rated contender Curtis Stevens at Madison Square Garden, “The Mecca of Boxing” and LIVE on HBO®. The referee for the middleweight world title bout will be Harvey Dock (NY) and the judges of the fight will be Michael Pernick (FL), Max DeLuca (CA) and John Poturaj (NJ). In the 12-round IBO Cruiserweight World Championship between Ola Afolabi and Lukasz Janik, the referee will be Earl Brown. The judges will be Waleska Roldan, Jerry Roth and Joseph Pasquale. 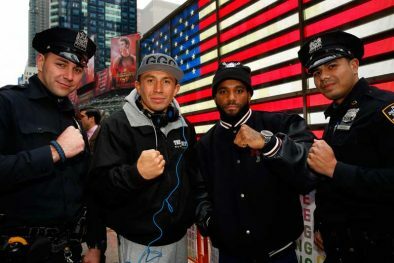 Gennady Golovkin Hits Time Square! Golovkin was swarmed by fans and media as he posed for pictures in front of the massive HBO billboard at 42nd Street and 7th Avenue promoting the fight. 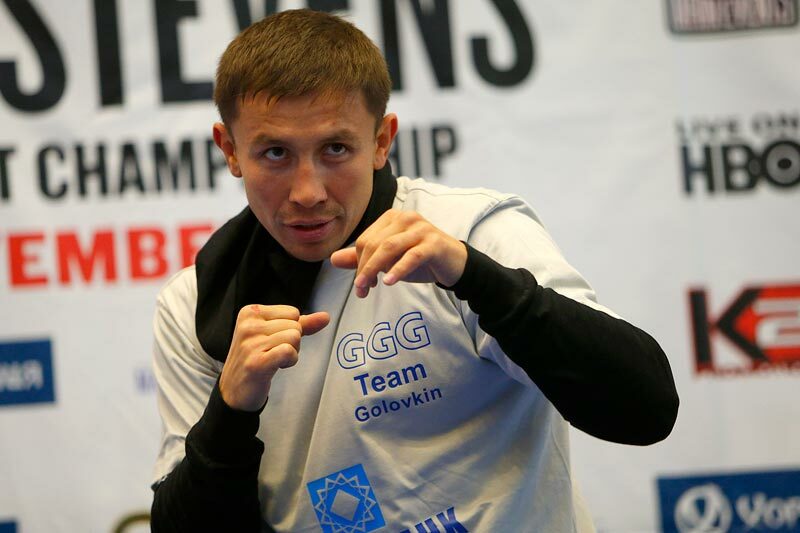 With the highest knockout percentage (89%) in the history of the middleweight division, Golovkin will be looking to extend his 14-bout knockout streak when he makes the 9th-defense of his world titles. This past January 19, in front of a full house of New York City fight fans, Golovkin dominated top rated challenger Gabriel Rosado, stopping him in the seventh round at Madison Square Garden. 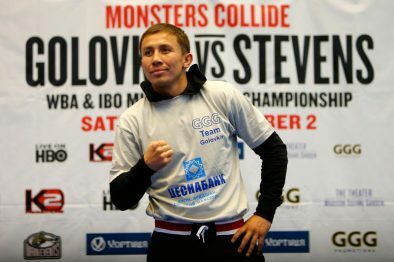 Golovkin vs. Stevens is a 12-round bout for Golovkin’s WBA and IBO Middleweight World Championship, presented by K2 Promotions in association with Main Events, GGG Promotions and Madison Square Garden. In the televised co-feature, undefeated heavyweights Mike Perez and Magomed Abdusalamov will clash in a 10-round bout presented in association with Sampson Boxing LLC.